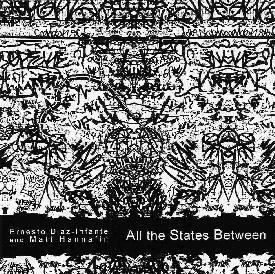 Ernesto Diaz-Infante & Matt Hannafin - "All The States Between"
Sub-titled An Electro-Acoustic Composition in Two Parts, All The States Between is a mail collaboration effort between San Francisco based Ernesto Diaz-Infante on electronics, turntables and field recordings, and New Yorker Matt Hannafin on all manner of percussion and things you hit or shake. The CD consists of two lengthy sound collage workouts, taking plenty of time to stretch out and explore at 46 and 30 minutes each. At its core the music is ambient, though the duo make liberal use of noise, dense tonal assaults and percussive clatter. Like much of sound artist Hal McGee's work, Ernesto and Matt explore a highly textural but often spacey universe, with plenty of fun strangeness thrown in. Aliens bleeps and blurps coexist with phasing, shifting and grating radio wave tones, while the percussion noodles along busily but somehow keeps the proceedings on a steady course to somewhere. Overall it was the contrasts that kept me alert and interested. Throbbing, high volume electronic blasts mow down all in their path, while the percussion breezes along at a controlled and measured pace. The sounds of city traffic serves as the backdrop for a UFO freakout symphony. And lots lots more. It can be a harsh and challenging listen at times. But patient, attentive, open minded sound collage fans will find much to enjoy here.